POZ is an award-winning print and online brand for people living with and affected by HIV/AIDS. Offering unparalleled editorial excellence since 1994, POZ magazine and POZ.com are identified by our readers as their most trusted sources of information about the disease. Offering daily news, treatment updates, personal profiles, investigative features, videos, blogs and an extensive online social network that includes POZ Personals (150,000 members and counting) and community forums (that are moderated and active 24/7), POZ addresses the wide spectrum of needs of people living with and affected by HIV/AIDS. Together, POZ magazine and POZ.com reach more than 70 percent of all people living in the United States who are aware that they are HIV positive. The magazine and website are also read by people who wish to know more about the disease, people who are considering getting tested for the disease, people who wish to prevent themselves from getting HIV and the staff and management of AIDS service organizations and HIV testing sites, and doctors, nurses and other healthcare workers. 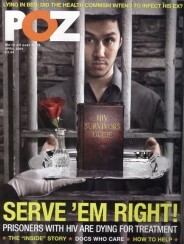 More than 125,000 copies of POZ magazine are distributed at thousands of doctors’ offices and AIDS service organizations nationwide. The magazine is also distributed at the world’s most important and well-attended conferences focusing on HIV/AIDS prevention, treatment and community issues. Magazine Single Subscription Not Available Outside the U.S.